It may be hard to believe, but the seventh year of Say on Pay (SOP) voting is launching with the 2018 proxy season. Overall, companies have done well on SOP. In 2017, investor support reached an all-time high with more than 80 percent of companies garnering a 90 percent or better favorable result. One notable exception, however, is Oracle (ORCL). For the past seven years, Oracle has had a poor SOP showing. The company’s SOP support was 67 percent in 2011, and then plummeted to below 50 percent, where it has lingered ever since. The overriding problem with Oracle’s executive compensation has been, in a word, “excess.” Even with consistent negative feedback from investors, Oracle awarded its three most senior executives over $100 million in aggregate compensation for 2017. Given that the SOP vote was not having an impact at Oracle, investors escalated their fight by voting “Against” the re-election of many of their board directors. In fact, in 2016, only six of Oracle’s thirteen directors received greater than 90 percent support for their re-election, and two of them were the co-CEOs, Mark Hurd and Safra Catz. The remaining seven directors received between 59 percent and 84 percent support, which is not exactly a compelling endorsement. Three of the four compensation committee members were among those receiving weak support. Only one member, Renee James, who had joined the board only one year prior, came out relatively unscathed with 97 percent support. 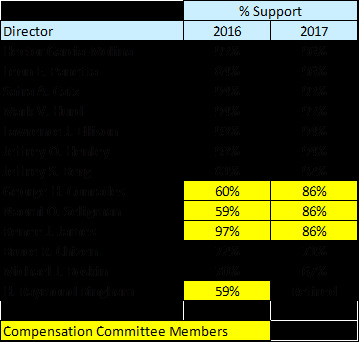 In 2017, the situation improved slightly but was still far less than satisfactory as all three of the compensation committee members received less than 90 percent support. Given that their seats on the board were in jeopardy, Oracle’s compensation committee members started to get the message. Last summer, after the 2017 SOP vote, Oracle announced that it was cutting its executive long-term equity grants in half for fiscal year 2018 and it didn’t expect any new grants until 2022. Moreover, the new grants will vest only if the company meets share price, market capitalization, and operational goals. It will be interesting to see whether this is enough movement for investors to swing their SOP vote to the positive end of the spectrum in 2018. There are a number of takeaways from this set of facts. First, investors are fairly lenient on SOP votes. It is well-known that investors generally vote more favorably compared to proxy advisors’ recommendations, and that certain investors, like BlackRock, have been accused of being too lenient on SOP. 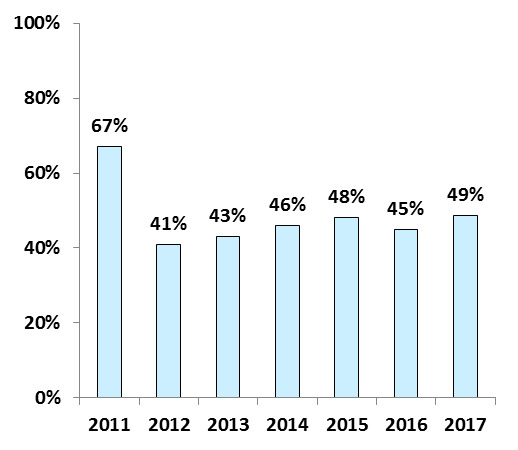 (BlackRock supported 96 percent of SOP votes in 2017.) Second, companies with perennial SOP issues would be better off if they voluntarily responded to investor feedback. This doesn’t mean that they need to do what investors tell them to do – in fact, this may be impossible since investors don’t always agree on the issues – but it does mean that they need to be responsive by either changing their pay practices or at least explaining their practices more effectively. Third, if board directors do not heed investors’ SOP “advice,” they should expect the process to escalate to the extent that their board seats may be in jeopardy. There is a point at which shareholders lose patience and the velvet gloves come off.